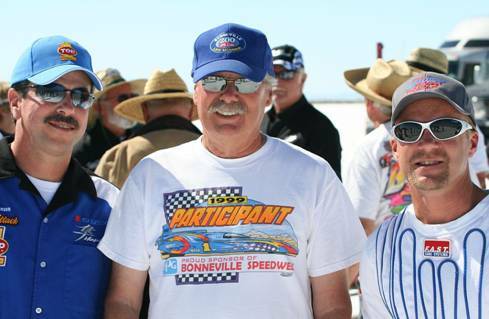 For the first time since 2006 the three all-time world’s fastest motorcycles and their riders will face off against one another at Mike Cook’s Bonneville Shootout. Rocky Robinson, three time and current motorcycle world land speed record holder, Chris Carr, AMA Dirt Track Champion and two time land speed record holder, and Sam Wheeler, fastest rider on two wheels in 2006, will meet head to head at the fastest wheel driven speed event on earth. If salt and weather conditions are favorable, this could be the year a two-wheeled machine officially breaks the 400 mph barrier. 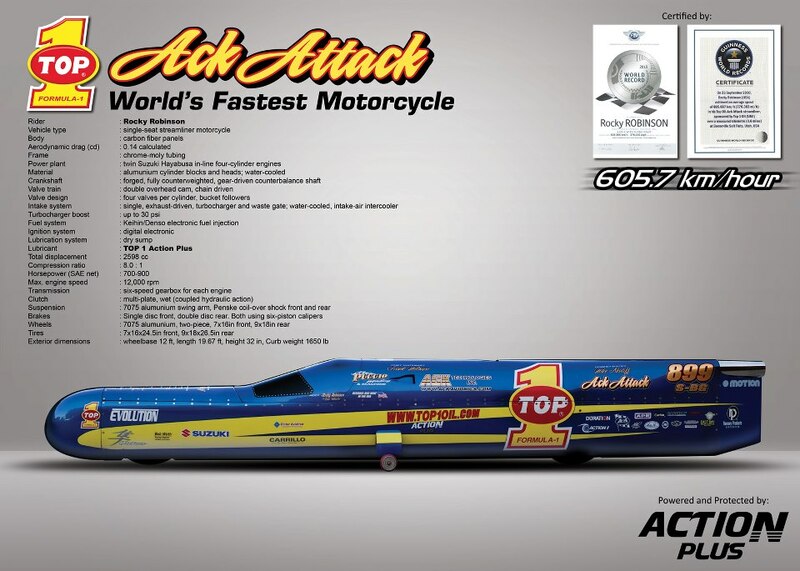 Rocky and the Top 1 Ack Attack came close in 2010, setting the current FIM Record at 376.363 mph. (based on two way average) His final run posted an incredible 394 mph exit speed through the lights! Tom Burkland (4 wheel land speed record holder) notified the team to check our data acquisition as our rate of acceleration through the mile indicated we should have eclipsed the 400 mark before decel. Our official speed through the mile: 379.3 mph entry, 387.1 through the kilo, 386.9 mile speed, with a 394 mph exit. Sure enough, Mike Akatiff checked our data acquisition through the MoTec. Rocky rolls out of the throttle gingerly after reaching peak speed so as not to cause an abrupt weight transfer to the front wheel which could cause severe handling issues. The bike was still gaining, actually increasing speed by 15 mph through the mile! It continued to gain speed as the throttle was slowly rolled back. Peak speed from data acquisition showed 401.7 mph! Is that number official? No it is not. Rocky knows and the entire Top 1 Ack Attack team knows they were the first to hit this milestone, even if it is a private victory. 2013 looks to be a good year for that number to finally make it into the books. Will it be Sam Wheeler with his new partnership with Fred Fox and the Parts Unlimited sponsored turbocharged Suzuki Hayabusa streamliner? 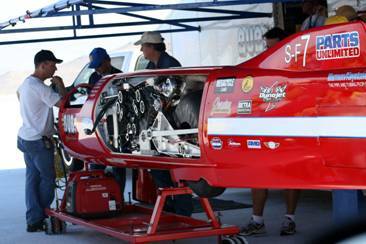 Vance and Hines built the motors which were supplied by Mike Akatiff from the Top 1 Ack Attack team. Or will Big Red, the Bub Seven entry ridden by Chris Carr get it done like he and his team have done twice in the past. Rocky did the early development work behind the controls of this machine before parting ways with Bub in 2005. Back then the bike wasn’t turbocharged. This change brought new speed and with the addition of a hard charging rider like Carr, the team is always a threat to the title. The Top 1 Ack Attack team is poised and ready to defend their record. They believe their machine already had it in it to officially reach the milestone of 400 mph, but technical problems prevented that from happening. 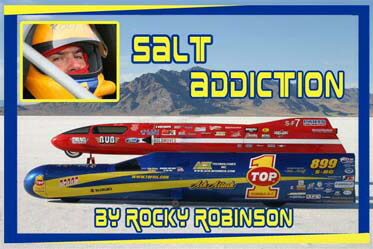 In 2011 Rocky and the machine crashed hard during testing, causing major damage to the Top 1 Ack Attack, earning Rocky a free ambulance ride to Salt Lake City for observation. He escaped with minor injuries, but still has that same desire to run faster than before, and 2013 could be the ultimate proving ground. Hopefully some of you can be there to witness history in the making. 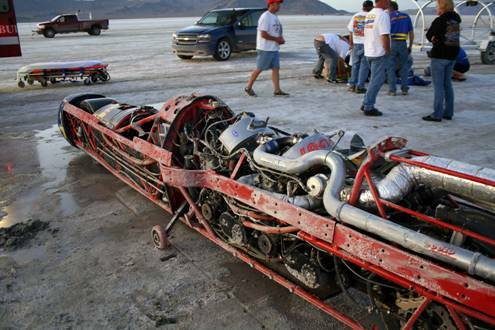 Its not everyday a motorcycle runs over 400 mph. If so, history will be rewritten. Click here to see The World Record for 2008!! Click here to see The World Record for 2010! !